After three terms in the Senate, Joe Lieberman may be headed for defeat--and a possible independent run. But it's not Joe Lieberman who's changed. It's partisan politics. IN NORMAL TIMES, this wouldn't be happening. Three-term senators and former vice presidential nominees aren't supposed to find themselves in coin-toss primary races for reelection. But Joseph I. Lieberman is fighting for his political life. On Aug. 8, Connecticut Democrats will choose between Lieberman and an upstart challenger, Ned Lamont-a J.P. Morgan heir, cable TV executive, and virtual novice in politics. Lieberman has vowed to run as an independent should Lamont prevail. Standard-issue punditry blames Lieberman's dire state on his enthusiasm for the Iraq War-and a grass-roots push from bloggers fed up with what they consider the Democrats' politics of accommodation. But the disillusionment with President Bush's Mideast policy can't fully explain the senator's woes. After all, mainstream liberals, many of whom don't necessarily favor an Iraq pullout, are also eager to see Lieberman chastened, if not ousted. Although some prominent Democrats-most notably Bill Clinton-have lately come to his aid, many others, including those who would ``stay the course" in Iraq, are responding coolly to his troubles, and declining to support him if he makes an independent run. And in New York, Senator Hillary Clinton-whom left-wing bloggers vilify almost as much as they do Lieberman-is facing a primary challenge from an antiwar leftist, Jonathan Tasini, yet her reelection seems assured. Far from the cause of Lieberman's difficulty, Iraq is a catalyst that has triggered a blow-up between the senator and his party that has been brewing for years. Two developments have fostered this estrangement. First, deep trends in American politics have led both the Democrats and the Republicans to grow more ideologically uniform over the last generation, making it harder for dissenters to remain viable within their parties. Second, Lieberman-despite liberal stands on such issues as abortion rights and the environment that have tethered him to the Democrats-has in effect nominated himself for excommunication by spurning liberals not only on the war but on such other divisive issues as Social Security privatization, taxpayer-funded vouchers for private schools, traditional morality, civil liberties, and so on. Lieberman draws praise from Washington sages for taking ``principled" and ``independent" stands. Yet it's precisely this contrarian streak that has made him so vulnerable today, and his plight reveals the increasing untenability of bucking the party line in an age of polarization. If Lieberman does bolt the party after Aug. 8, then, his departure won't be a historical fluke. It will, rather, reflect the new normal state of the relationship between Democrats and a senator who, having hewed to political convictions at odds with mainstream liberalism, has rendered himself a party of one. Conventional wisdom divides the Democrats into two camps: liberals (who are supposedly backing Lamont) and centrists (sticking by Lieberman). But in truth, those who are often called liberals-people who share the politics of The Nation magazine or filmmaker Michael Moore-are really leftists. The so-called centrists, for their part, actually encompass several discrete groups: mainstream liberals, whose politics mirror those of your average Democratic senator; upscale ``neoliberals," who champion economic growth and technological policy solutions; and the Southerners and Westerners linked to the centrist Democratic Leadership Council, who tend to list rightward on social and foreign policy. In which camp does Lieberman sit? He's clearly no leftist or liberal: He has consistently taken conservative positions over the years-on social issues, where he calls for more religion in public life; on regulatory issues, where he favored leniency toward the accounting firms during the Enron crisis; and above all in foreign affairs, where he has even chided liberals for criticizing Bush's governance during ``wartime." At the same time, notwithstanding his former chairmanship of the Dixie-based DLC, Lieberman's Northeastern Jewish roots disqualify him from being grouped with the Southern conservatives. The neoliberal rubric might work a bit better-except that Lieberman's signature issues, such as foreign policy and drum-beating about morality, stand in sharp contrast to those of neoliberalism's globalization-obsessed technocrats. Another possibility is that Lieberman is a neoconservative. Today that label is often used obliquely-and disparagingly-to signify Jews whose support for Israel is presumed to dictate their hawkish foreign policy views. But the term originated in the early 1970s to describe liberals, such as the intellectuals Norman Podhoretz and Irving Kristol, who concluded the Democrats were too ready to deploy government power at home and too unready to deploy it abroad. Although neither Bush nor his chief advisers fit the neocon profile, his foreign policy has been guided by neoconservative principles-notably, a distrust of the international community and the corollary that America must fiercely protect its own interests-that Lieberman, rare among Democrats, shares. Still, Lieberman would almost certainly bridle at the neocon label. For all his departures from liberal orthodoxy, he has gained endorsements from the League of Conservation Voters, the National Abortion and Reproductive Rights Action League, and other key progressive groups. The senator is no Norman Podhoretz. Lieberman is sui generis in national politics-and for the most part he has managed his idiosyncratic worldview well. But historical shifts have helped put him in the fix he's in. A generation ago, the Republicans and the Democrats both contained multitudes. But in the 1960s the parties began to realign along ideological axes. The GOP's growing conservatism repelled ``Rockefeller Republicans"-Northeasterners of WASP heritage who were pro-business but progressive on social issues. The Democrats' espousal of civil rights and other liberal causes alienated Italian and Irish Catholics, white Protestant Southerners, and like-minded working-class voters. Neocons-such as Democratic policy aides Jeane Kirkpatrick and Richard Perle, who went to work for Ronald Reagan-switched sides, too. In recent years, as polarization has made it harder for ideological outliers to remain viable within their parties, this process of Red Rover-style swapping between the Democrats and Republicans has intensified. In Rhode Island, the moderate senator Lincoln Chafee-one of the last of the Rockefeller Republicans-is facing a primary fight in September; if he loses, his seat will probably go Democratic. Two years ago, Pennsylvania Senator Arlen Specter had to fend off a similar challenge from the right. For centrist Democrats, the situation is similar, but with rivals surfacing on their left. To some of his critics, Lieberman's threat-or promise-to leave his party if he loses to Lamont represents the culmination of a career of opportunism. They recall that in 1998, he blasted Bill Clinton on the Senate floor for his behavior in the Monica Lewinsky affair just when Clinton was most vulnerable-thus winning Lieberman praise for taking a ``moral" stance but heightening the danger of impeachment. Amid the Florida election recount in late 2000, too, Lieberman echoed the Republican demand to count all military ballots, including those that had been disqualified-gaining the high ground for ``supporting the troops" but undermining his party and indeed his own candidacy. Yet the accusation of acting in self-interest-a strange charge to level at any politician-is especially inapt for Lieberman. His dissents from liberal positions appear to be driven by genuine belief, and his centrism legitimately positions him well to make deals with Republicans in good conscience. 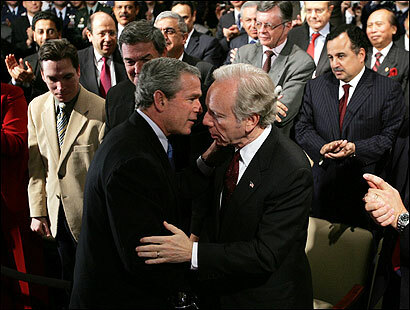 On issues like immigration reform or ``the goal of a free and independent and democratic Iraq," Lieberman said in a debate with Lamont on July 6, ``I'm not going to oppose [President Bush] . . . because he happens to be of the other party. . . . I'm one of the senators who is able to reach across the partisan divide to get things done." In fact, it's Lieberman's fidelity to his deeply held beliefs that poses the problem for liberals. With a conservative constituency to answer to, a Democratic senator such as Ben Nelson of Nebraska or Evan Bayh of Indiana can break ranks and still gain absolution from liberals, since they are protecting senate seats for the party. Lieberman, in deep blue Connecticut, has no such excuse. Lieberman stands by his principles; it's just that those principles bear less and less similarity to those of the liberal New Englanders he purportedly represents. Indeed, sticking by his convictions is precisely what has left Lieberman without a political home. Last Monday, President Clinton joined the senator on the campaign trail. (``Joe Lieberman to Accept Endorsement From Noted Moral Degenerate" the satirical website Wonkette noted when Clinton's support was first reported.) Lieberman, said Clinton, ``is a good man, a good Democrat, and he'll do you proud." The senator, for his part, continued to make a virtue of his maverick record. ``Stick to your principles," he exhorted the crowd. ``Fight for your principles." Clinton has chided the shrill left-wing bloggers who are calling for Lieberman's head, suggesting that the left's habit of targeting liberals instead of conservatives undercuts its own aims. The point is accurate as a historical matter, with Ralph Nader's 2000 presidential candidacy standing as the most salient recent example. But it misses what's going on in Connecticut. Lieberman is at risk today not because of Internet-based leftists (except insofar as they publicized Lamont's challenge) but because of rank-and-file liberals like those who turned out for the state party's convention in May-where they awarded Lamont enough delegates to force the primary in the first place. These mainstream Democrats have simply grown uncertain whether to return to office someone whose politics no longer seem to reflect their own. No grass-roots insurgency is implementing a ``purge" in the Democratic Party; purges aren't imposed from the bottom up. Lieberman's possible exit from the Democratic Party is closer to a mutual parting of the ways, a divorce on grounds of irreconcilable differences. Connecticut Democrats may decide-through a democratic vote-that they don't want him, and he may decide that his true support in the state lies with independents and Republicans. David Greenberg , a professor at Rutgers University, is the author of ``Nixon's Shadow: The History of an Image" and the forthcoming ``Presidential Doodles." YOUR VIEW: How much ideological diversity can a party contain?